University of Chicago Press, 9780226535036, 240pp. In early 2012, the global scientific community erupted with news that the elusive Higgs boson had likely been found, providing potent validation for the Standard Model of how the universe works. Scientists from more than one hundred countries contributed to this discovery—proving, beyond any doubt, that a new era in science had arrived, an era of multinationalism and cooperative reach. Globalization, the Internet, and digital technology all play a role in making this new era possible, but something more fundamental is also at work. In all scientific endeavors lies the ancient drive for sharing ideas and knowledge, and now this can be accomplished in a single tongue— English. But is this a good thing? In Does Science Need a Global Language?, Scott L. Montgomery seeks to answer this question by investigating the phenomenon of global English in science, how and why it came about, the forms in which it appears, what advantages and disadvantages it brings, and what its future might be. He also examines the consequences of a global tongue, considering especially emerging and developing nations, where research is still at a relatively early stage and English is not yet firmly established. Throughout the book, he includes important insights from a broad range of perspectives in linguistics, history, education, geopolitics, and more. Each chapter includes striking and revealing anecdotes from the front-line experiences of today’s scientists, some of whom have struggled with the reality of global scientific English. He explores topics such as student mobility, publication trends, world Englishes, language endangerment, and second language learning, among many others. What he uncovers will challenge readers to rethink their assumptions about the direction of contemporary science, as well as its future. Scott L. Montgomery is an author and affiliate faculty member in the Henry M. Jackson School of International Studies at the University of Washington. A consulting geologist for more than 25 years, he has written many technical papers and monographs on energy-related subjects and is the author or coauthor of numerous books, most recently The Shape of the New: Four Big Ideas and How They Made the Modern World and Does Science Need a Global Language? English and the Future of Research, the latter published by the University of Chicago Press. He lives in Seattle. David Crystal is a writer, lecturer, and broadcaster on language. His more than one hundred books include The Stories of English, Wordsmiths and Warriors, The Oxford Dictionary of Original Shakespearean Pronunciation, and The Story of Be. "As a writer and translator of scientific texts, Scott L. Montgomery has had a front-row seat to an extraordinary development: the rapid ascent of English as the lingua franca of science." 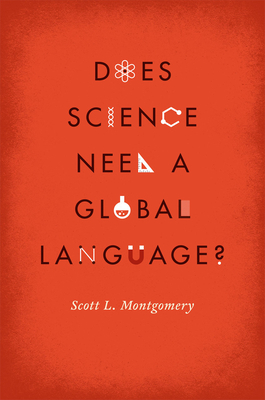 "In this interesting, entertaining, and highly informative read, Scott L. Montgomery teases apart various expected and several unanticipated considerations in determining whether science needs a global language. . . . It is without a doubt a meaningful read for scientists, science educators and researchers, and particularly those interested in science within the context of language and history." "An intelligent and learned book. . . . In linking linguistic developments and changes to individuals’ life stories and [Scott Montgomery's] own experience, he communicates that the personal and political are interconnected and that the production of knowledge is part of historical, political processes and shifts in power, often played out in the daily tragedies, failures and fragilities of ‘real people’. This is not a naive or triumphant book about English as a global force. It is a book written by a modernist, a believer in science as a joint, progressive human project. For this purpose as well as for its sheer learnedness and elegance of expression, it is well worth a read." "Montgomery gives an informative and even-handed account of the state of play, enlivened by anecdotes about professional encounters with non-native English-speaking scientists, and makes thoughtful suggestions as to what this implies for scientific education and publishing." "Because both educators and researchers at all levels encounter increasing levels of globalization, this book is highly recommended for all." "It may seem obvious that English is the one truly global language, but Scott Montgomery, himself a professional translator, is the first to assess the costs and benefits of this fact with such clarity." "Montgomery makes a convincing case, and he does it with an engaging style." "Montgomery gives a clear overview of the issues surrounding any possible international language of science, and makes a convincing argument for the acceptance of the reality of the place of English in the world. . . . [T]his is a fascinating book that takes a pragmatic view of an important, though potentially contentious, subject."